BBC - Shakespeare On Tour - Who can we thank for Shakespeare's popularity? Who can we thank for Shakespeare's popularity? Despite shuffling off this mortal coil 400 years ago, William Shakespeare has never been more popular with his plays being staged continuously in the both the UK and abroad. But apart from the great man himself, there's another historical figure - and his involvement in a particular soggy weekend in Stratford upon Avon - to whom we own much in terms of The Bard's popularity. 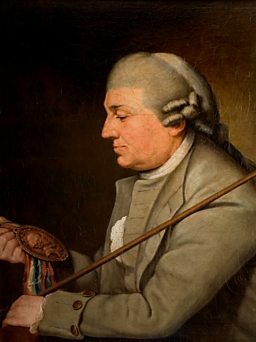 Actor, playwright and theatre manager David Garrick (1717 – 1779) had a profound influence upon the way in which we enjoy and appreciate Shakespeare today. As an actor Garrick introduced a more naturalistic and restrained approach to performance, departing from the frequently bombastic acting styles of his predecessors and contemporaries. He also considerably raised the status of the actor, making the profession a respectable one. Behind the scenes, as a manager, Garrick reformed stage practices, banishing the public from the backstage areas, introducing new costumes, employing innovative set designers and promoting new acting talent. His significance, however, did not end with his performances in the theatre. When a Jubilee to celebrate the genius of Shakespeare was proposed to be held in Stratford-upon-Avon, Garrick was the obvious choice to mastermind the event. When a Jubilee to celebrate the genius of Shakespeare was proposed to be held in Stratford-upon-Avon, Garrick was the obvious choice to mastermind the event. The Jubilee, held over three days, began on Wednesday 6 September 1769 and attracted thousands of visitors. Sadly the festivities did not go entirely to plan. Heavy rain caused many of the outdoor events, such as the planned pageant of characters from Shakespeare’s plays, to be abandoned. However, events scheduled for the rotunda - the large wooden building erected on the banks of the Avon especially for the celebrations - did go ahead, despite the threat of flooding, with Garrick’s Ode upon Dedicating a Building and Erecting a Statue to Shakespeare at Stratford-upon-Avon being the highlight. Although marred by the torrential rain that so often marks the latter stages of an English Summer, Garrick’s Shakespeare Jubilee had a lasting significance. The celebrations put Stratford-upon-Avon firmly on the tourist map, while the sale of Shakespeare-themed gifts and memorabilia marked the beginnings of the Shakespeare souvenir industry we have today. David Garrick is often credited with ensuring Shakespeare’s 18th-century survival and reputation. 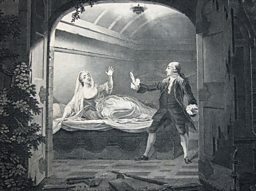 Garrick also enjoyed considerable success with his subsequent production, The Jubilee, which played out the events at Stratford - including the pageant of characters from Shakespeare - under the safety of the roof at Drury Lane. David Garrick is often credited with ensuring Shakespeare’s 18th-century survival and reputation. Indeed Garrick’s grand funeral at Westminster Abbey stands as testament to his outstanding success in making Shakespeare, the stage and the art of acting both socially acceptable and of national significance. 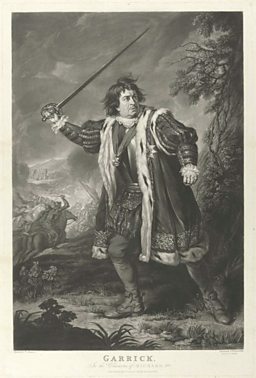 Visitors to the British Library's Shakespeare in Ten Acts exhibition will be able to enjoy several items relating to Garrick, and to the Shakespeare Jubilee of 1769, including a portrait of him playing Shakespeare’s Richard III, arguably his most famous role. Together with this, his own commemorative playbill outlines events at the Jubilee - the commemorative medallion worn by visitors to the Jubilee, complete with its multi-coloured ribbon representing the many facets of Shakespeare’s genius and a satirical handkerchief lampooning the events. An original playbill and commemorative souvenirs of David Garrick’s Shakespeare Jubilee of 1769 will be on display in the British Library’s Shakespeare in Ten Acts exhibition (15 April – 6 September 2016). David Garrick in performance. Credit: The Samuel Johnson Birthplace Museum, Lichfield. Where did the term 'bardolatry' come from?